A note from FRWP Prime Minister, Edison Waromi, calling for a unity among West Papuans and to join hands together to have a coordinative resolution agenda to bring the people of West Papua to enjoy a peaceful, free and full sovereignty. 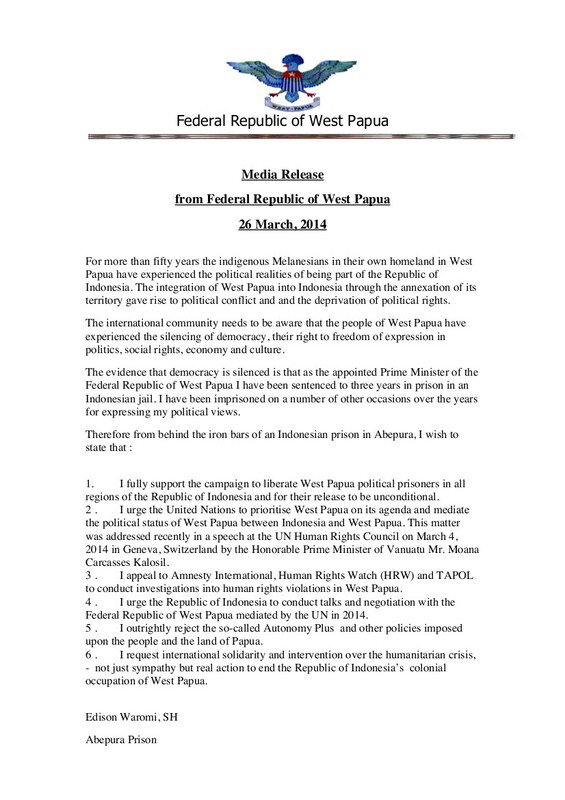 STATEMENT BY FIVE PAPUANS WHO WENT ON TRIAL IN JAYAPURA ON 30 JANUARY 2011. Published in West Papua Media, translated by Carmel Budiardjo. A moral appeal on behalf of the Jayapura Five, first published in West Papua Media. From Abepura Prison Edison Waromi calls on international support to end the Republic of Indonesia’s colonial occupation of West Papua.